This week I had another off-lake excursion where I experienced more rocks and more mountains - they are even called the Rocky Mountains! 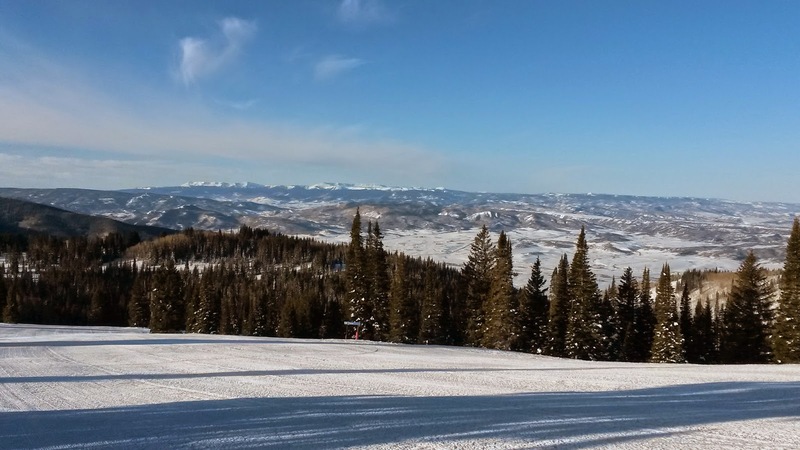 Yes, we traveled to Steamboat Springs, Colorado, where the mountains are far newer and much higher than our White Mountains. The Rocky Mountains were formed a mere 55 to 80 million years ago; contrast that to our Granodiorite-based mountains in the Lakes Region formed some 400 million years ago. According to the museum exhibit I visited last week, when the White Mountains were first formed they were even higher than the Rocky Mountains are today, but have been worn down over the past several hundred million years, and they continue to wear away as most recently demonstrated by the collapse of our state icon in Franconia Notch in May 2003. 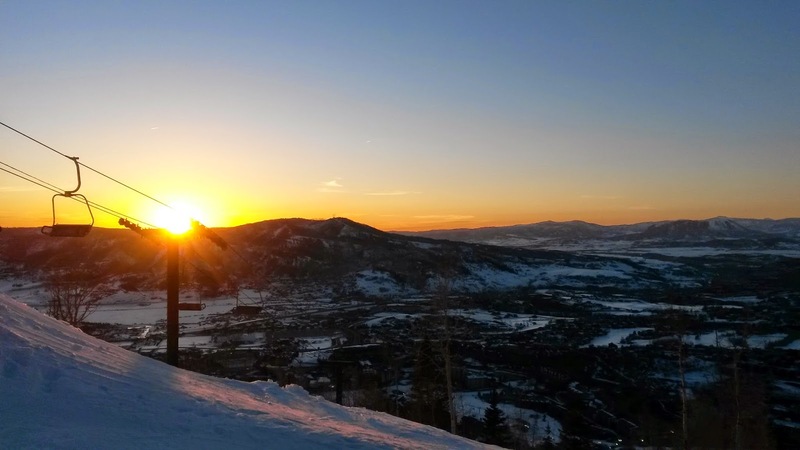 Another aspect of the newly-formed mountains in Colorado, as in places like Yellowstone National Park, is the proximity of heat from the earth's hot core which creates hot springs, one of which gave the town of Steamboat Springs its name. 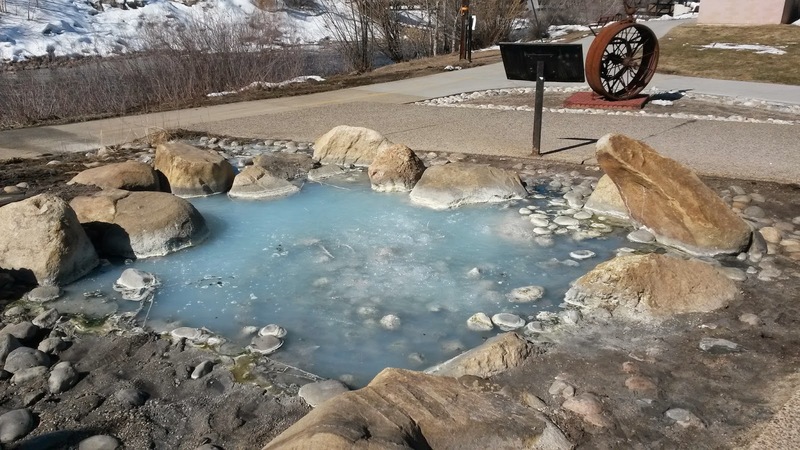 The Steamboat Spring - so named because it made a chugging sound that reminded the early pioneers of a steamboat - is no longer active, but many others are. The "Sulphur Spring" for example, which bubbles at 72 degrees even on the coldest winter days. There are still "tie-down" rings at this spring, used by early settlers to secure their horses to let them drink from the restorative water. 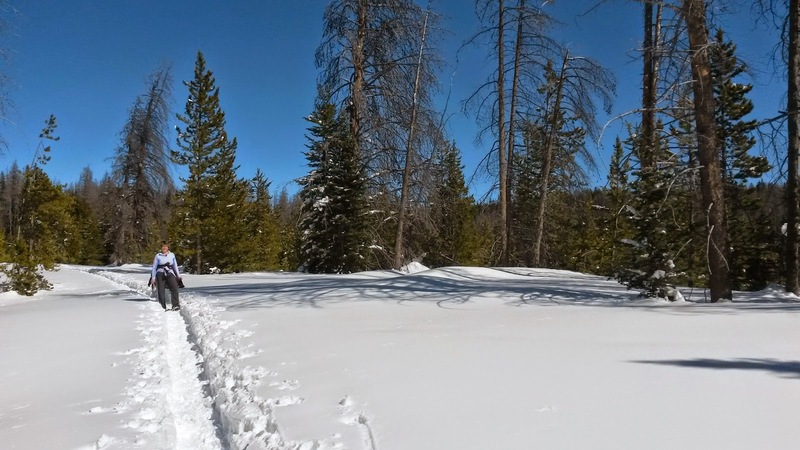 We did some snow-shoeing in Rabbits Ears Pass, 9426' elevation, and were treated to a Colorado Blue sky, much like that in our own mountains (Franconia Notch, February 22, 2015). New England calls the low point between two mountains a "notch", where in the Rockies it is called a "pass". 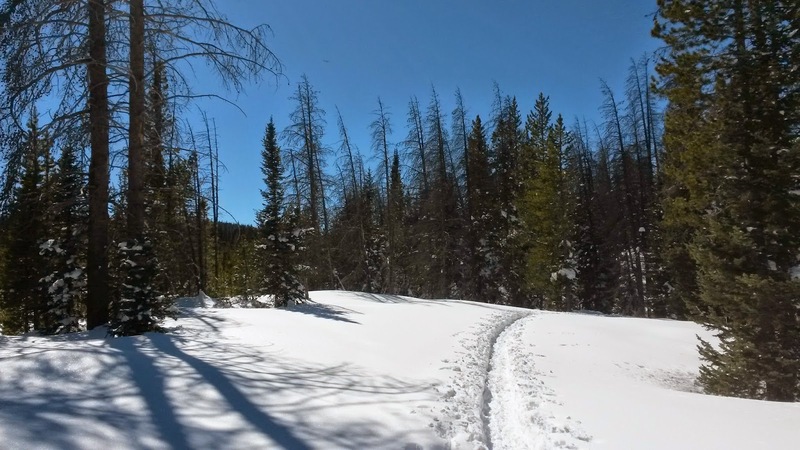 Did you notice the dead Lodgepole Pines? Colorado forests are suffering from an invasive species, the Mountain Pine Beetle, which is devastating large swaths of pine forests and adding to wildfire concerns. It is a reminder that we must be diligent in watching for and preventing invasive species in our own regions, whether it's the Emerald Ash Borer, which has now made its way to New Hampshire, or Milfoil in our local lakes. Keeping a lookout for Colorado wildlife I saw a few animals, many of which are the same ones we have in New Hampshire, including this Downy Woodpecker in an Aspen tree. At the top of the mountains there are Gray Jays which behave the same way they do in our mountains, taking food right out of your hand if offered to them. I also saw hawks, squirrels, and tracks of fox and weasels. But the most impressive sighting was a huge moose standing right at the edge of a ski trail, munching on the buds and twigs of Aspen trees. It was completely unfazed by skiers zipping by, but the ski patrol was on site, keeping people moving along the trail so there was no opportunity to stop and snap a picture. It was by far the largest moose I have seen - maybe just because it was so close! I'll be home soon; I read a report that the bears are already out and about, so it's time to take in those bird-feeders. And whether at home in Meredith, or across the country, I'm always drawn to the magic of a beautiful sunset.